Description: 41T rolls past the corn field at Hiawatha Road just east of Owego on its trek west to Toronto. Description: The CN trains must have gotten out of their slot, since they rarely ran with more than four units, and even that was unusual. This 41T seen across the corn at Hiawatha Rd has six, so a set must have gotten out of its cycle, and is now being moved back home as part of this massive consist, with 85 cars in tow. Description: a eastbound mixed freight rolsl through Durand. Description: K122 with CN power. If you have seen this train please leave comment with the numbers and model of the locomotive. Description: Southbound at Ford Avenue. Description: Two Dash 8's trail on the Z. 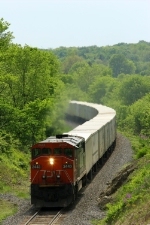 Title: CN 2443's "All Aboard"
Description: CN C40-8M 2443 holds with a ethanol train while SOO 4435 works a pull-out job.